… is half the battle with an addiction, right? Today, Comcast and a slow Monday at work made me face my problem, head on. I am addicted to blogging – meaning posting here and reading your blogs – and to Ravelry. Heck with my personal email accounts; they serve only to deliver my “you have a comment” emails and other stuff that isn’t so important, like reminders that I have minutes to type up and a marketing plan to develop for my assorted volunteer efforts. Please Comcast, I want my Hi-speed, but I NEED a connection of any sort if I must sit in that office for 8 hours tomorrow!! Whew. Wick love. It’s the Pedicure Sock. It’s more stockinette than I favor, but it’s a safe, happy way to channel that sock zen back into my fingers! So, critique away. 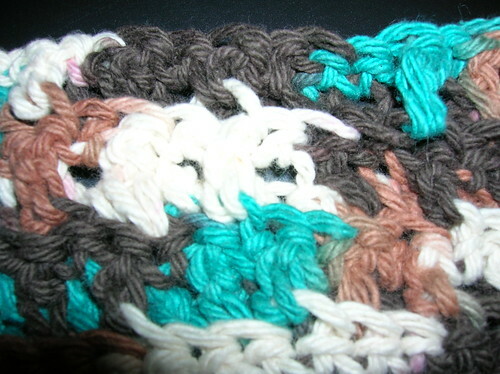 Fireflytook a crochet class recently, and she said the instructor said to crochet through both loops on the foundation. Makes sense, but I SWARE I ain’t read that in nond of my learn to crochet booklets. This entry was posted in Crochet, socks. Yes, I open my blog mail before other “stuff” too! Pretty yarn for your new socks – KOCT is on my list of yarns to try 🙂 Love the new addition to your family – she may be young but looks like she’ll be a tea drinker to me. It’s my understanding that you do crochet through both loops unless told otherwise. There are patterns that tell you to crochet through the back loop only. When going through both loops, you don’t get that “line” that is made up of the front loops still sitting there. Does that make sense??.. or have I only served to further confuse you?!? I’ve got that same Honeysuckle cotton–cool colors! I am so with you on the addiction. I read a blog tonight that asked how much knitting one does in a day. Looking at the clock I realized I had been knit-blogging for 2 hours and had an hour left to actually knit. The reason I love knit night so much is that I ACTUALLY KNIT THERE! That Wick looks lovely – reminds me of summer that I wish would hurry up and get here. 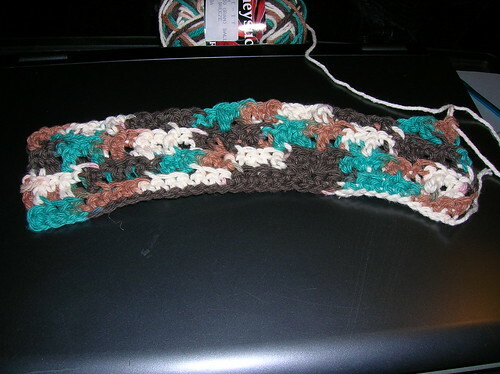 Crochet – I think I may need to learn that soon too. Glad Mary could help you out with the directions. Sissy strikes again! 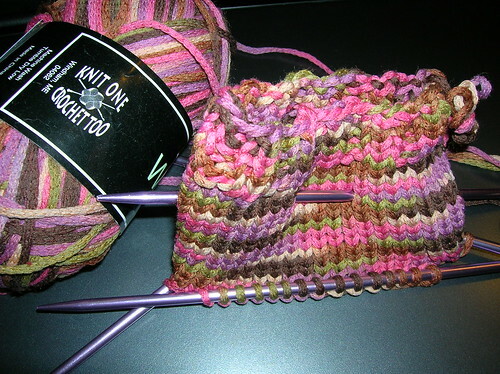 Blogging/reading blogs is so much fun I find myself doing less knitting then I probably should. Becky is right! Its a matter of looks 🙂 But courage 😉 Its just a matter of perseverance! I’m with you with the addiction! Gurl how did you squeeze this post in without Comcast? AAh yes the pedicure socks are a perfect way to get your sock mojo back! You know there are online videos of crocheting in YouTube and specifically here: http://www.nexstitch.com that could help you out. Crochet? What crochet? All I see are Wick socks. Ahhhhh Wick. Loverly Wick. I know nuttin’ bout hookin’…. but the colors look great! “Hello. My name is Dianne and I am a blog addict.” Boy, that felt good! Love the colors of the socks, but I can’t help with crochet. I’ve tried it again and again, but it always looks wonky. I never know where to put the hook. I’ll stick to knitting – not as much guess-work! I’m addicted too! I read blogs, ravelry and email all day at work. I’d be lost without my computer. However, I am not so great at blogging. I need to make more of an effort to blog more and of course add more pictures. Beautiful sock yarn – love that colorway! I got some of the Wick in Maine last July (not that gorgeous of a colorway though!) and really need to knit it up! Definitely be lost without a computer..always blog reading and emails! Get lost in them sometimes..I’m here to help if I can, but doesn’t look like your doing too bad so far. Love the colorways of both projects, especially the socks!!! Sissy has good taste! I’m making the Pedicure socks too!! I am half way through the first one and I haven’t picked it up. I’m being stubborn and trying it on magic loop with a short needle but I think I’m going to be happier if I just give in and switch to the dpns. 🙂 Yours look great!! I am Nancy, and I am a blogaholic. to name one 🙂 I am not sure there is a 12-step program for this. I am so NOT busy at work I spend 75% of my time online browsing…reading…sometimes shopping. At least I look busy..
My hubby will join in on that support group Jessi mentioned! ha ha!! I’m loving that new pink & purple yarn!!! MMMMMM!